This post is sponsored by Teamson®. All opinions are 100% my own. It’s officially that time of year when we are all thinking about what gift to give the ones we love, and a bunch of us specifically have kids to think about! We all want to give them a wonderful Christmas! 🙂 This is why I am so glad that I recently got to know more about the Teamson® family of brands! 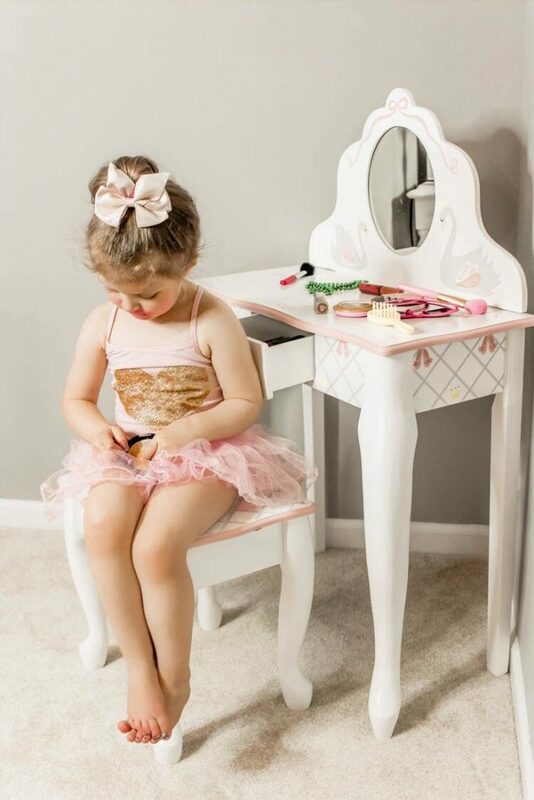 They have the most darling, hand-crafted and hand-painted furniture for children from their Fantasy Fields brand. 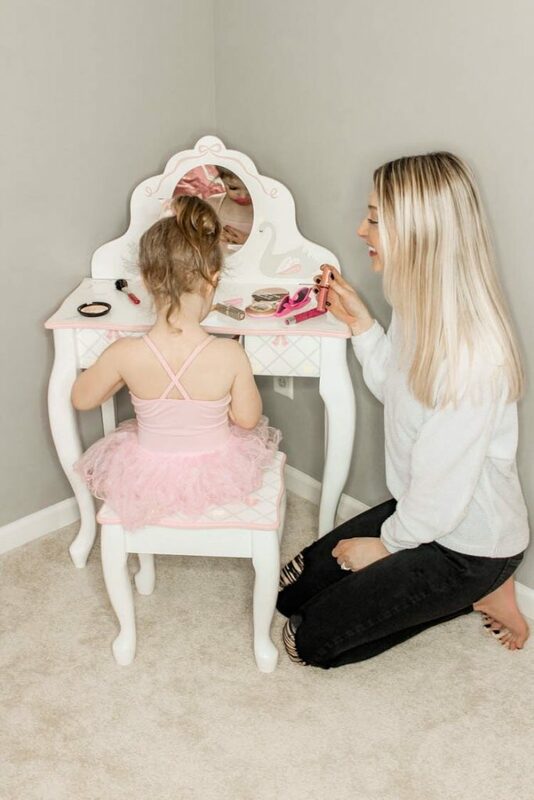 They also have kitchen playsets and other children’s items (Teamson Kids), doll furniture and accessories (Olivia’s Little World), and even furniture for grown-ups (from their Versanora brand)! I have looked at lots of furniture for Lana over the past few years, and Fantasy Fields definitely has the most unique kind of quality furniture I have come across! 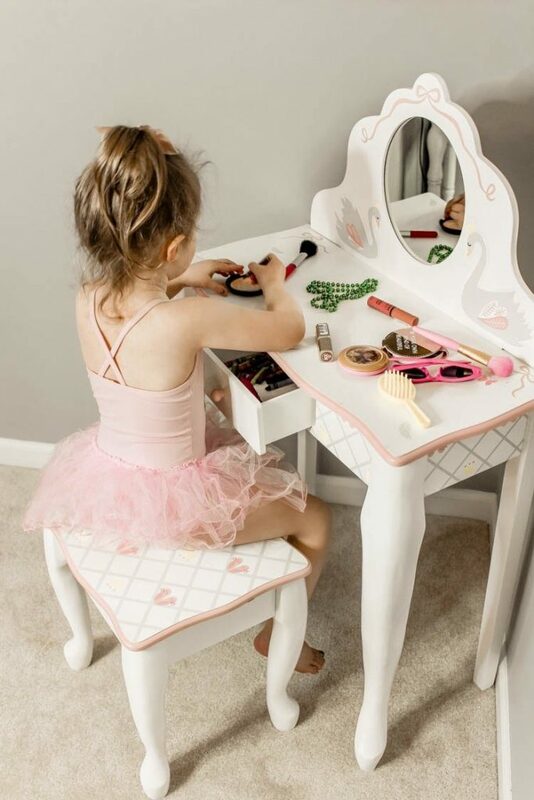 Teamson® let me pick out a Christmas gift for Lana, and I ended up choosing this lovely Swan Lake Vanity Table & Stool Set from their Fantasy Fields brand. 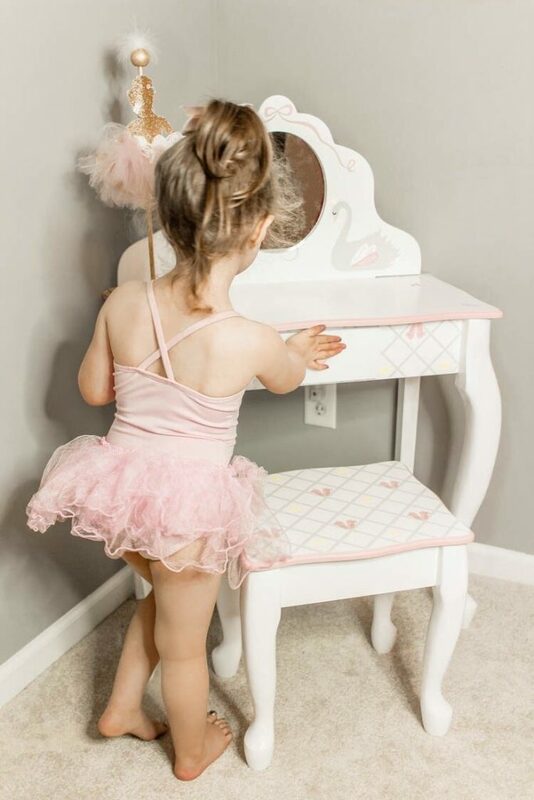 I immediately knew that I wanted to get her something with the Swan Lake theme! 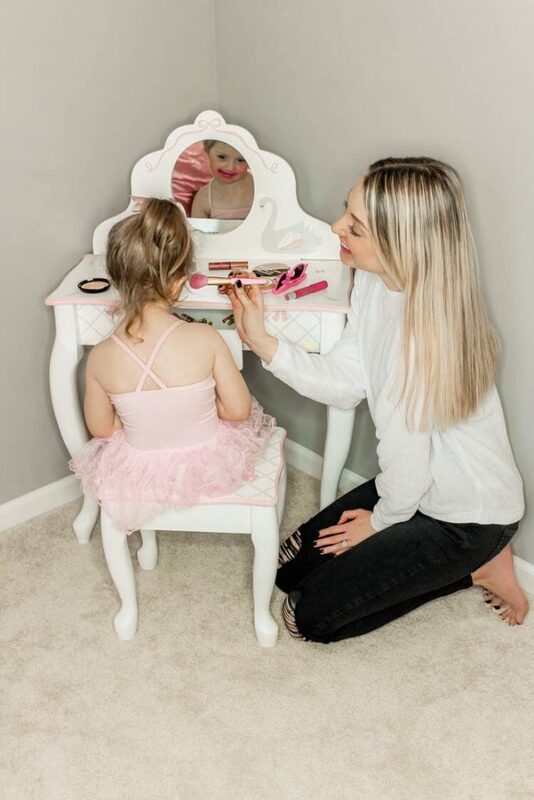 Lana loves anything ballerina related (and so do I)! 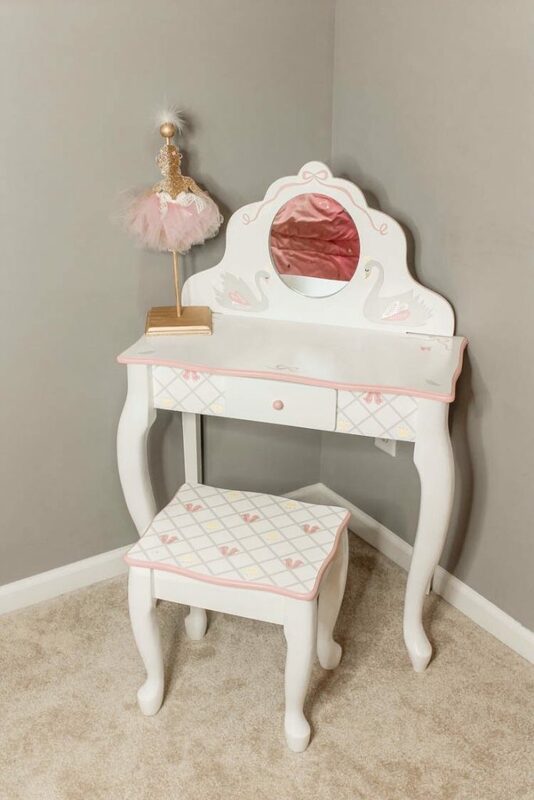 🙂 They also have a bunch of other Swan Lake themed furniture! 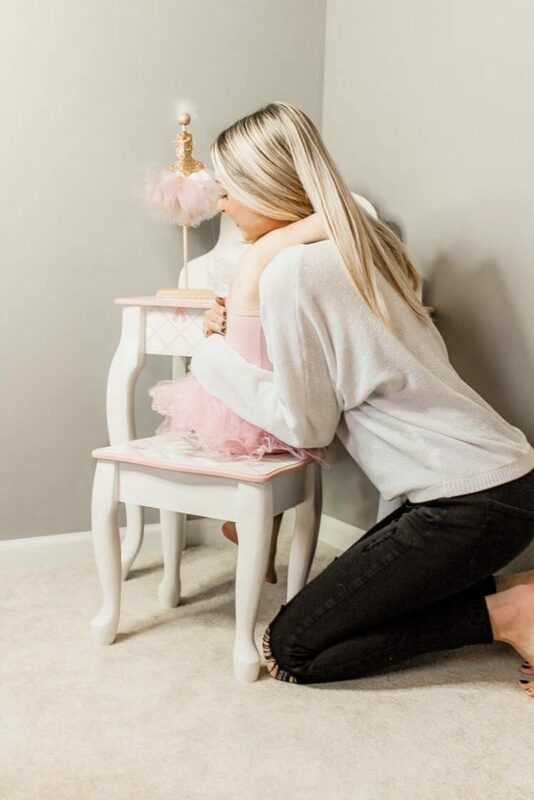 I would love to add even more of them to her room! There are really so many cute things, and I want them all! Ashton put Lana’s table set together, and he said that he was so impressed by how well it was made! Then I took Lana up to her room to surprise her when Ashton had it ready. 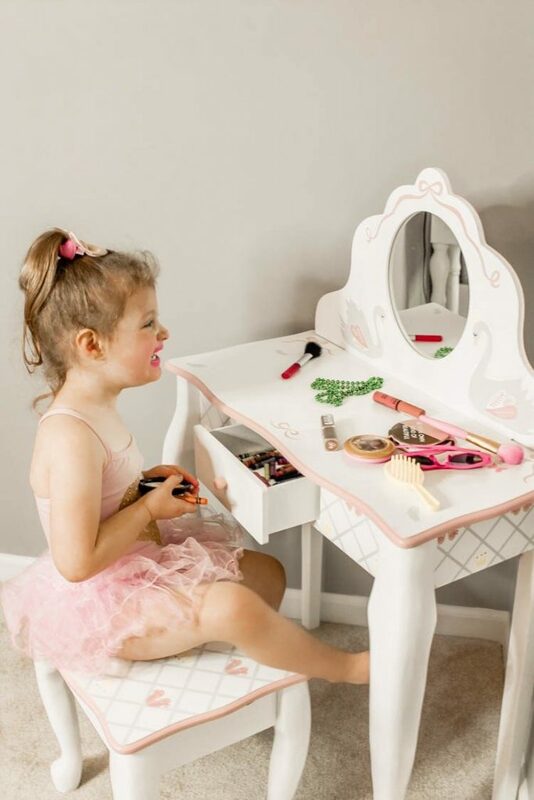 It was so sweet how proud she was to get her own special piece of “big girl” furniture! She has already been using her imagination with it a ton! 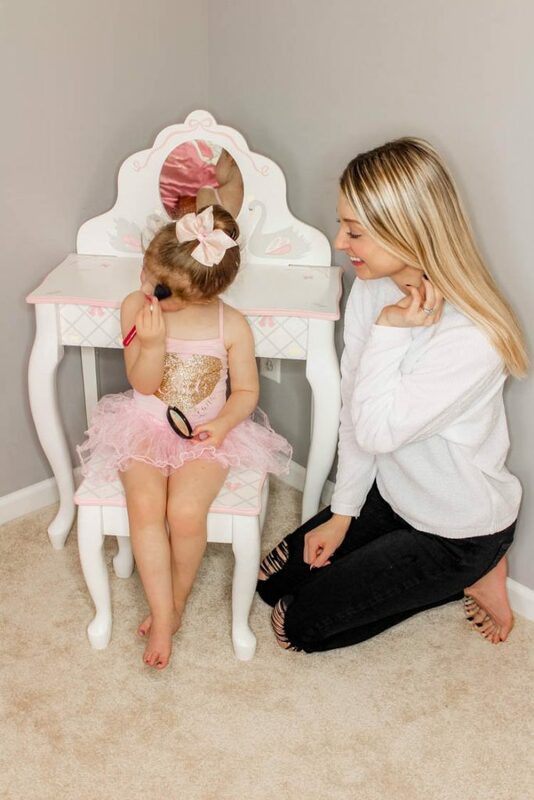 She keeps putting her pretend makeup (and mine) in the little drawer. 🙂 It’s her very own special spot in her room now where she can sit, pretend, and play. We had an empty corner in her room, so it worked out really well! She is also taking such good care of it so far! I know we will make a bunch of memories with it! I know any child would love something from the Teamson® website! I’m so happy to be able to share a special discount code for you all below! There is also a way you could win $3,000 cash and $750 in Teamson® products! Give Your Kids the Gift of Wonder This Christmas with My Discount Code Below! If you want to get your child/children a special gift from Teamson®, I have a discount code for you guys to use on their website! Use my code “TeamsonRLB20” to get 20% off any purchase on teamson.com. The code is valid through December 14th, so just make sure to use it by then! You can also enter the “Teamson® Win the Workshop” Sweepstakes here for a chance to win $3,000 cash and $750 in Teamson® products! If you do get anything from the Teamson® website, make sure to share your photos and videos of what you picked! Then use the hashtag #TeamTeamson and tag the featured brand/collection (mine was Fantasy Fields) for a chance to get your content shared by Teamson®! You can always subscribe to the teamson.com e-newsletter for exclusive deals and promotions! You can also follow each brand on social media. Find Fantasy Fields on Instagram, Facebook, Twitter, and Pinterest! This entry was posted in Lifestyle and tagged Christmas gift ideas, Christmas gifts, create memories, creativity, furniture for kids, gift, gift ideas, gift of wonder, gifts for toddler girls, gifts for toddlers, hand-crafted, hand-crafted furniture, hand-painted, hand-painted furniture, imagination, inspiration, kids Christmas gifts, kids furniture, making memories, swan lake furniture, toddler Christmas gifts, toddler furniture, toddler girl Christmas gifts, toddler girl furniture, unique furniture, vanity table, vanity table set.